My mother retired just over a month ago. She’d worked with the same company for the last 24 years of her career, and she loved the work that she did. But my brothers ended up getting themselves some children (you can find anything on the Internet), and apparently watching grandbabies poop is a whole lot more fun than working. Not to mention that her steady hatred of her alarm clock eventually became too great to resist, until she finally determined that it needed to be destroyed. 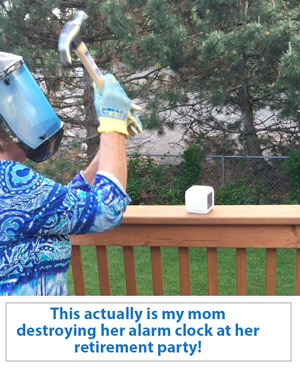 So in a scene that would make all Office Space lovers intensely proud, she took a hammer to her alarm clock (see photo/video here if you don’t believe me), pounded it into the dirt, and swore that it would never torment her again. Retirement, she promised herself, would be conducted on her own terms. And so far she’s doing well, as is pretty much everyone who’s only 5 or 6 weeks into retirement. She’s waking up when she wants, visiting family, reading more, spending time with friends, grilling out 7 times a day, and otherwise taking full advantage of the reward she has earned. Moreover, she managed to retire with her finances in decent order – she won’t be taking Mediterranean cruises every six months, but she also won’t be forced to go back to work in a few years. If she decides to volunteer or work part-time at some point in the future, it will be a decision rather than a forced necessity. Fortunately for my mother, her retirement is going the way retirements are supposed to. So far, hers is the model American retirement. Which means there’s only one thing I need to worry about. A few years ago I was speaking at a conference in Anaheim, and the gentlemen before me was a self-described “retirement expert,” which sounds like an awesome career because it means he should be really good at golf and tennis and pointing at things while on a guided tour. He pointed out two things that have stuck with me for the last five years. The first, which is more observation than advice, is that people are living long enough these days that the ‘retirement’ phase of our lives is almost as long as the ‘working’ and ‘child-rearing’ phases of our lives. His argument, which makes sense to me, is this: anything we’re going to spend decades doing is something that we should approach with at least a rudimentary plan in place. And then he shared a statistic that I have not been able to forget. To put that in perspective, the average person works about 45 hours a week and watches around 15 hours of television a week – which means that the average retired person is replacing approximately two-thirds of the time they used to devote to working to watching television instead. Is it because there’s just that much great television to watch? If you’ve ever complained that there’s nothing to watch on all 500 channels of television you have, then I doubt you’d make that argument. Instead, what seems to be happening is that too many people enter retirement with no clear idea of what they want to do with themselves – and so they do nothing. I don’t mean to suggest that watching television is a bad thing to do. But watching 7 hours a day for the rest of your life isn’t anyone’s idea of time well spent. I’ve yet to hear the deathbed confessional that goes, “My only regret is that I didn’t watch enough television.” Retirement is supposed to be relaxing, but there’s a difference between being relaxed and being a vegetable. I love taking naps, but I’m not particularly interested in slipping into a coma. I hope my mother continues to enjoy her retirement, and I hope she watches as much football as she can handle (which is an absurd amount). But I’ll admit that I am glad that the football season is only 5 months long. There are too many other things to do, and I want my mother to enjoy the hell out of every minute – without the use of an alarm clock. CORRECTION: I want to thank a few of my readers for making me aware of being a dummy. I made the mistake of assuming that someone else knew his facts without double-checking them myself. Turns out that according to the Bureau of Labor Statistics, the average retired person watches between 30-35 hours of television a week, not 48. That’s still way too much, but not quite as apocalyptic as I made it sound. Sorry for the error! Great blog, thanks for posting! I fully agree with this except at times I wouldn’t mind slipping into the occasional short coma, but not for retirement. Where is the stat about TV from? There’s no source listed, and the U.S. Bureau of Labor Statistics says about 28 hours a week (still a lot). TY for the Retirerment Info. My GrandSon says I am Retarded instead of Retirered. I find that volunteering keeps me busy. My wife said ” What to you mean, you have 4 Meetings these week, you are Retired?” Well it keeps me active and not sitting watching so, much TV. All the best, enjoy your Newsletter.